Joe and Tasha Chapman of Chapman at Sea in Boca Raton, Florida have a big love for the beach, great design and dogs...two people after my own heart. It's important to this husband and wife team that they create items that are both functional and durable, yet also have great design. These dog leashes are made of a super sturdy cotton rope with hand tied eye splices that are traditionally used by sailors to secure the handles. And then a leather tassel is added for a bit of fun flair (that's removable if desired). Find them all here... and while you're in their shop, don't miss their fab beach bags and surfboard covers. ...we just can't help but pamper them. I'm thinking a lot about dogs today as my little pug, Gorilla, who is about 15 or 16 years now, isn't doing so great. Right now he's by my feet where he feels safe and at peace as walking and navigating around the house is now a bit of a painful chore. I love him to the moon and back and would do just about anything for him, which is why I'm in the mood to see what's new over at the See Scout Sleep shop...these adorable pics are from their Instagram feed. See Scout Sleep originated in New Orleans, Louisiana in 2011. 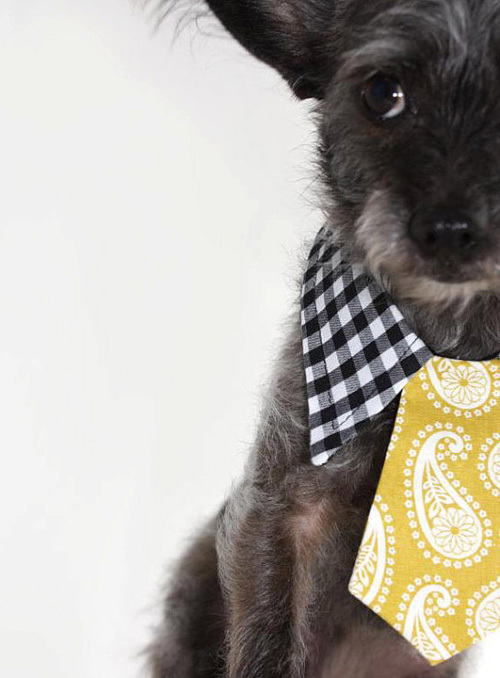 Interior Designer, Katie Logan was on the lookout for stylish pet gear so, as the industrious woman that she is, she just designed it herself. The high quality, environmentally friendly products (made with hemp fabrics, organic cotton, kapok and buckwheat) are all made in Louisiana but Katie recently found a business partner in Amsterdam which has helped turn her Southern brand into a global one. . I love to support companies such as Katie's but what makes it even more special is how 10% of all proceeds go to local animal shelters and charities along the Gulf Coast. See Katie's entire shop, here. 1. Hair of the Dog Flask, $24. What can I say? It's the holidays and we all need extra gulps of Christmas cheer. 2. Chewed, $25. My dog Maisie and I have mourned many chewed up toys and this book reminds me of many of them. 3. White Dog sweatshirt, $145. Designer Nicole Musselman's sly wit shines through in this bold, stylish sweater. 5. Throne Dogs print, from $150. Juliette Borda is one of my favorite illustrators. I see her charming work regularly in the New York Times Style section. 6. Dog luggage, $40. I definitely would've wanted this as a kid. Instead, I had a giant and furry cat head overnight bag. 7. Letterpress card, $5. The handsome craftsmanship of this letterpress stationery, all made in Dallas, is a signature of designer, Lily Smith + Kirkley. 8. Maison de Pawz dog treats, from $5. These dog treats are lovingly made in New York. And they have the cutest mascot, Tyler, whose adventures I follow on Instagram. My friends Monica and Chris (who I just featured in the Low Country Boil post) recently began fostering a pup named Petunia. 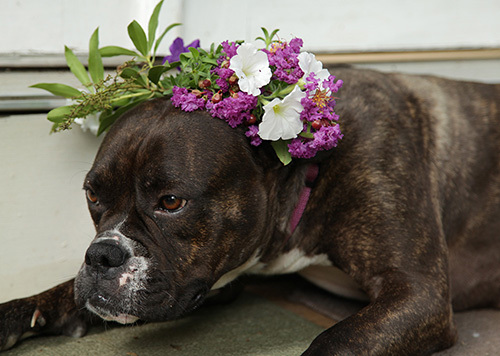 She is about 3 years old, weighs 50 lbs and is believed to be a Bulldog/Boxer mix with perhaps a breed or two or three more mixed in... She is as sweet as can be and needs a place to call home. Monica, "Petunia is mellow to the point of sometimes being mistaken for a piece of furniture. She never barks or chews and she barely sheds. She is not a 'bolter' and we often hang out on the porch watching the world go by with no fear of her chasing squirrels, cars or strollers. She loves her crate and will nap there throughout the day and night. She is learning to walk on a leash and gets better at it every day." 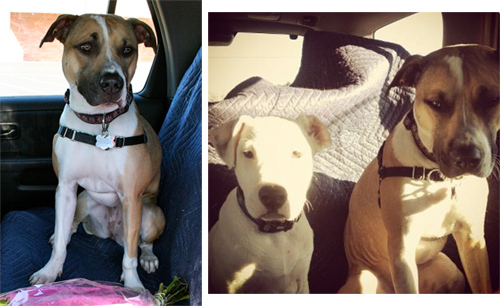 Petunia is lucky to also have another pup in her foster family. Her name is Magnolia, whom Chris and Monica adopted last year. The two get along beautifully and seem to have the same temperment. Every time I stop by, Magnolia and Petunia are often lounging side by side, perfectly chill under the hot southern sun. Monica and Chris often call Petunia by her new nickname, Potato. Monica, "We call her Potato because all she really wants to do is snooze on the couch." ...but did not appreciate them placed upon her head. Good sport though- she at least let me get the shot. Monica and Chris are fostering Petunia through a wonderful organization called Ruffus Rescue in Atlanta, which do weekly adoptions at the Pet Supplies Plus location from 11am-4pm. 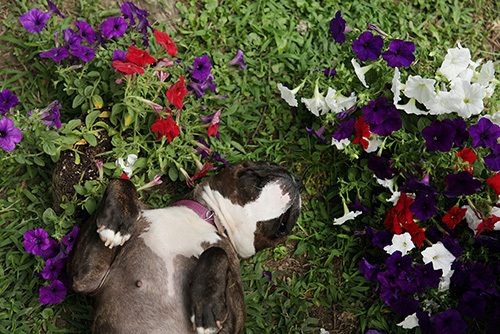 You can find Petunia there on the weekends, or contact Monica directly to schedule a time to meet. You really can't find a better pup (or foster parents). 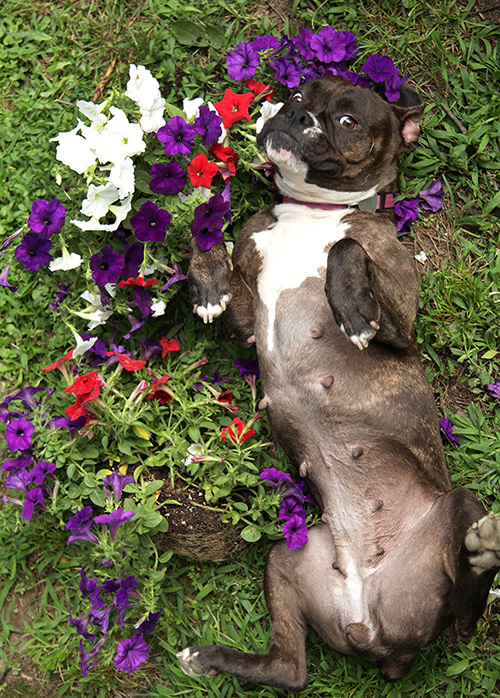 I hope this July 4th, we can celebrate a new home for this very sweet, loving, adorable Miss Petunia. Their well designed products are handmade utilizing sustainably grown, hypo-allergenic materials such as hemp fabric, chemical-free buckwheat hulls and poly-fill made from recycled plastic bottles. Love that. It's hard to find a good leash but in their shop, it's easy. Their offerings are all colorful and cute, like every dog deserves. 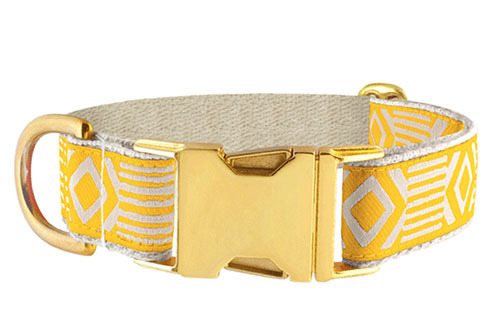 Great collar options as well...my favorites have a bold and fanciful brass clasp. I think it's time to upgrade my pet's accessories as now I feel their hardware is quite inadequate. Find all your favorites at See Scout Sleep, here. 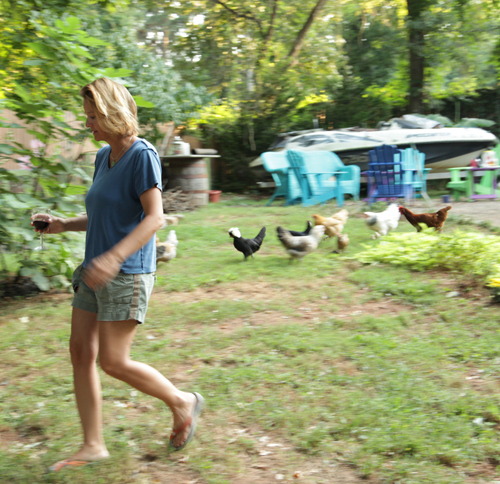 Kara has 11 chickens in all and each one is quite different than the next. This is Fleur, which is French for flower. 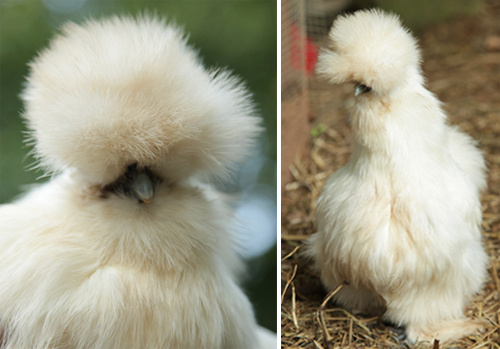 Her breed is, afterall, Mille Fleur d'Uccle. Mille Fleur means 'thousand flowers,' which plays off her pretty plumage. Fleur is full grown here and Kara calls her the Love Chicken as she can't wait to snuggle. Kara pets her every day without fail- "She loves to be petted. Her whole body vibrates." Kara says that Mango, shown top right, is incredibly sweet and friendly. 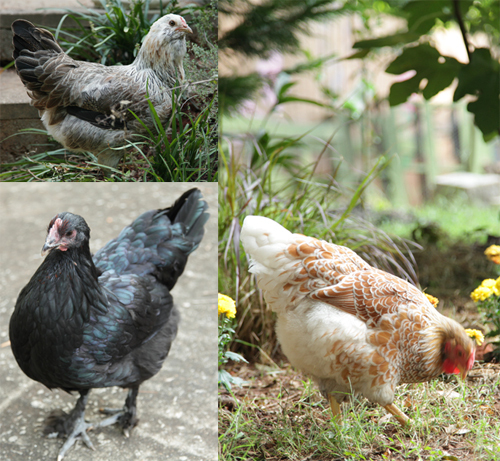 Chicken Piccata, a Polish chicken, (they are called Polish but are actually from Holland) is bottom right. Kara, "Piccata is neurotic and screamy. My daughter, Walker and I joke that she's always filing a complaint with the Administration!" 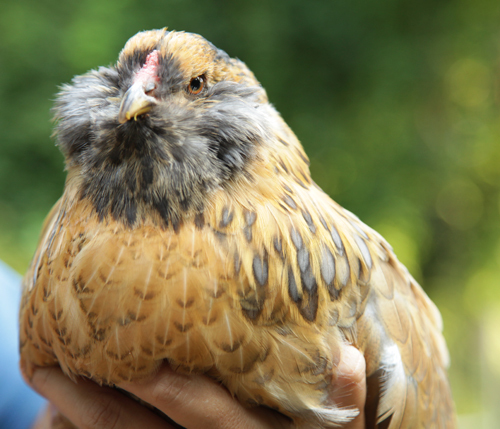 This gorgeous thing is a Wyandotte chicken which Kara aptly named, Tammy Wynette. She has russet brown feathers laced in lavender. Her pretty plumage makes me think of a pine cone and the perfection and genius of mother nature. Tammy Wynette is the most gentle bird of the group. And then came Izzy-Belle. How can you not love this lanky, cotton ball charmer? 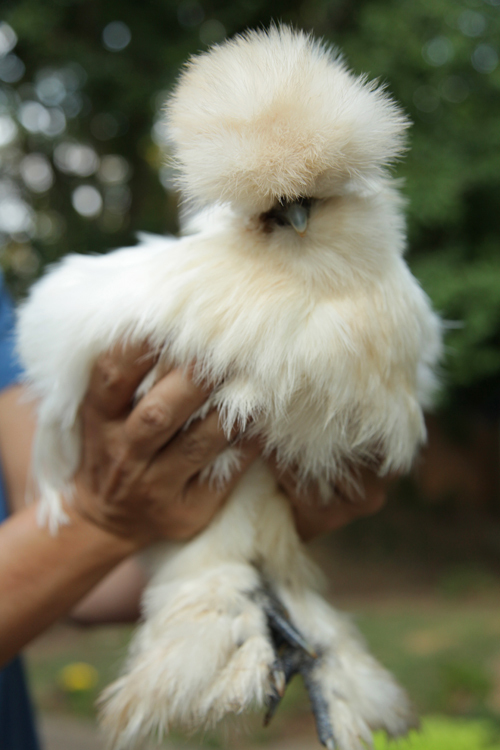 She's a Japanese Silkie with five toes on each foot and black skin, whom Kara describes as "meek like a melted bunny." She's a little on the dumb side and can't fly at all, so Kara built her a special needs ramp up to the coop so she can roost with the others. (As Kara says, "Bless her heart.") Kara also is Izzy's part time stylist- cutting hair away from her eyes so she can see. When Kara called all the chickens back into the coop, they all came a running, except Izzy-Belle...she was in her own little world of course. We retrieved her by hand. 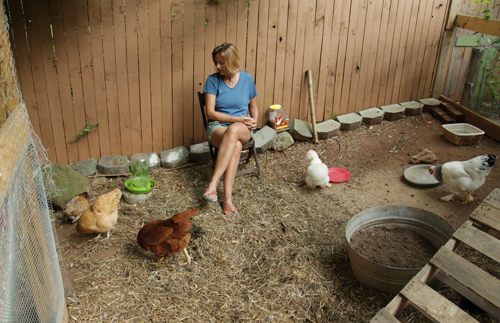 As Kara is a contractor, she built her own incredible coop using reclaimed materials and leftover pieces from contractor jobs. The tin roof is new but the pink door Kara found in the West End and all the trim came off a house from a recent gig. The stained glass window is Victorian from 1890 and the side window is a craftsman from 1910. But my favorite part may be the 60' long chicken tunnel or Chunnel Kara recently added to the coop that runs along the far end of her property. Lots of chicken owners use them to give their birds more space and protection. 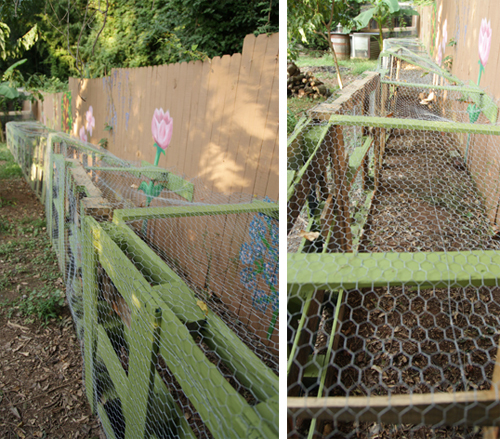 Kara built hers from wooden pallets, then painted the chunnel a green color to blend with the yard. She found a Valspar historic paint color called La Fonda Jalapeno, which thrilled her to no end. The chickens went wild with the new addition. Kara, "Their knees were up high like ladies in skirts, running down the thing." From top left is Jackie Onassis, Tammy Wynette and Sipsie. If you're in Atlanta this weekend, come meet Kara, Ellen DeHeneres, Izzy-Belle, Chicken Piccata and others at the fabulous Urban Coop Tour. 12 chicken coops will be featured and will certainly be an entertaining way to spend an afternoon or two- especially if you're hoping to start your own backyard brood. Purchase tickets here and checkout the Urban Coop Facebook page here. When I was pondering what to blog about for Valentine's Day, my friend Tiffany answered my question in one phrase, "What about Valentino?" Valentino is a puppy that Tiffany and her husband, Jeff were about to rescue in a few days time. They had just seen this one photo of him with a heart shaped nose and the name Valentino was born, as well as a love for this little guy they had yet to meet. Valentino was being fostered by Christine Totten after being rescued by Amanda Liston and her partner, Terry King of Carolina Care Bullies. 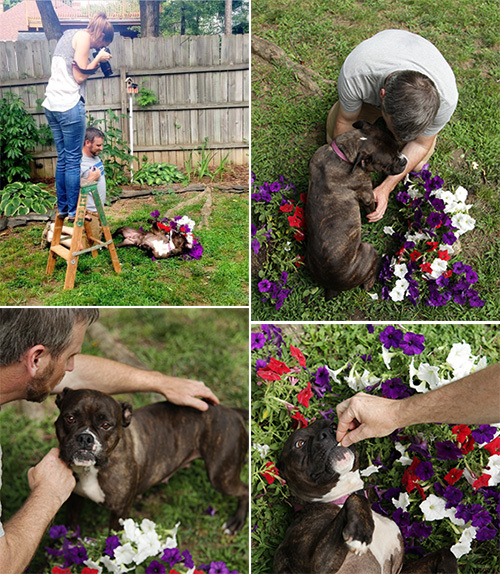 Amanda and Terry rescue dogs, focusing on pit bulls on death row in North Carolina shelters. They have so far placed 250 pit bulls into permanent, responsible homes. Many have a negative idea of pit bulls, which is often fueled by the media, but the many pits that I've met over the years are truly sweet, loving dogs...and they love to clown around. Mischa realized that Valentino was the most amazing play friend ever. As Mischa is just a year and a half old, she has a ton of energy. As I saw her last week with my two dogs who have arthritis, back problems and no real desire to leave their dog beds, she was none too pleased with their lack of enthusiasm. Valentino, on the other hand, could play for hours and hours on end...and they did, almost four hours straight. And that was just day one. They have since bonded beautifully. Mischa loves her little brother. She licks him incessently and watches over his every move. So Mischa found her Valentine in a cute four month old aptly named Valentino- so lucky. She's not even two and she's already got love all figured out. 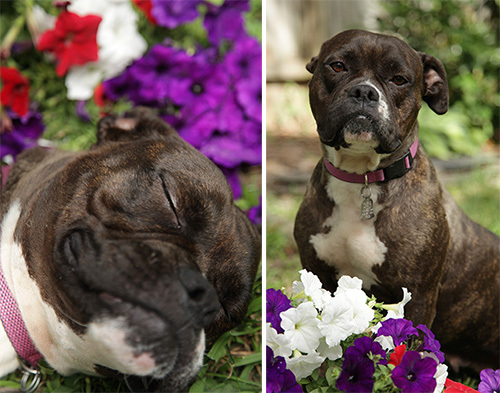 (amazingly, the happy pair were rescued from the same animal shelter and happened to be fostered by the same caregiver) I hope this offers a little inspiration to rescue your own dog someday...and check out the site of Carolina Care Bullies. They give those on death's door the best gift of all. A chance at love. As autumn is in full swing, there's a need to add layers and get cozy and warm. The same holds true for our pups, which is why these stylish dog cowls, hand made by Kate Butler of Raleigh, North Carolina, are so necessary. 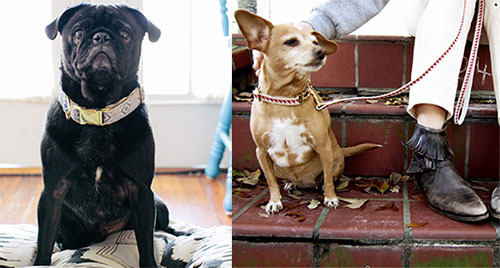 The best part is these canine cowls are made from upcycled jersey fabric that Kate finds at The Scrap Exchange in Durham, NC, as well as thrift stores like Cause for Paws and ReTails Thrift Shop, which donate to animals in need. 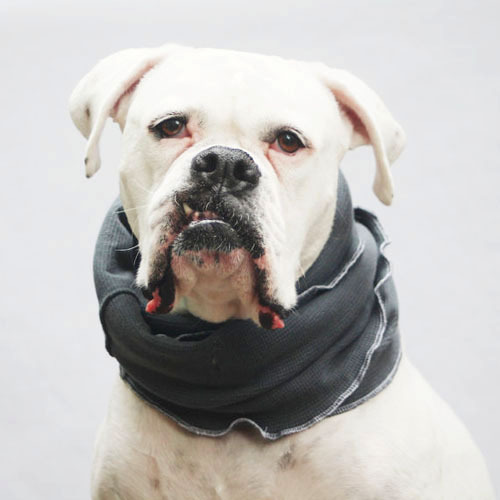 The cowls are patiently and expertly modeled by Kate's white boxer, Eleanor. She knows how to work the camera, doesn't she? With so much recyclable material at her disposal, Kate also makes squeaky dog toys that can be personalized with embroidery. Sizes come in small, medium and large. Pretty packaging is always a plus and Kate does not disappoint as each cowl or toy is wrapped in heavy duty recyclable Kraft paper, tied simply with a white ribbon and tag. What a great gift...thanks Kate! Peruse the entirety of her lovely store here. The ties are particularly popular for special occassions- such as weddings, anniversary and birthday parties. Jalina also makes a variety of colorful bowties for the pups whe prefer to be a bit more trendy. This week's freebie is especially fun as it's for the dogs in our lives. Dublin Dog from Charlotte, North Carolina (where I just so happen to be writing from today) have been so gracious to offer one Sweet Peach viewer a free Babylon collar and matching leash of your choice. 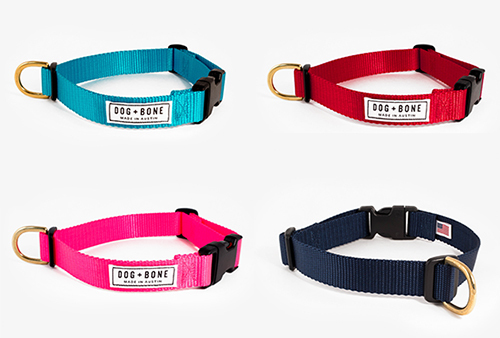 If you haven't experienced these collars, you're missing out. They are 100% waterproof and as their site exclaims, "they won't absorb moisture, retain dirt or harbor bacteria." Just leave a comment below and I'll pick a winner via random.org this Friday, December 16 at 5pm. 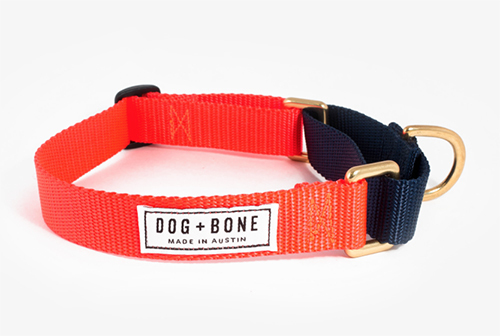 I'm a huge fan of Dublin Dog's Original All Style, No Stink Collar. Their latest version includes a 100% waterproof sub layer for increased strength and durability, a new double buckle and softer, more pliable material that will withstand anything mother nature throws your way. Just comment below for a chance to win a leash and collar for your pup...and thanks so much Dublin Dog! Kent and Amberlii are the husband and wife team behind Bow Wow Beds. 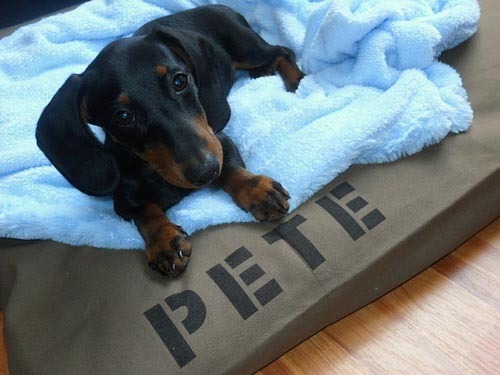 Based in Northern Kentucky, they custom make dog bed covers for our beloved pooches. The fabric is a durable duck canvas which comes in a variety of sizes, including XXXL for the big dogs in our lives. Besides a bevy of pretty colors to choose for your fabric, Kent and Amberlii also offer these incredibly fun chevron stripes. This is a necessary shop in the dog owner's life as many of us know the pain of trying to find a well designed bed to fit in with our decor. Why not make the dog bed a complementary conversation piece if you can? See all of Bow Wow Beds fashionably cool dog covers here. 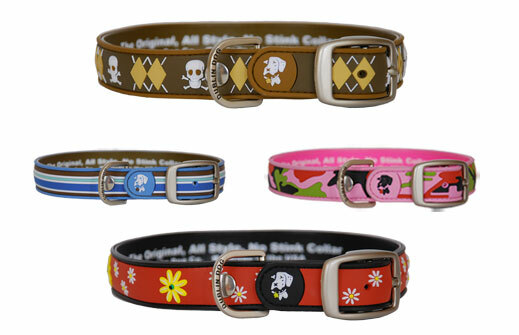 I first found these dog collars when I lived in Los Angeles and became an instant fan. I own a pug and a lab, and for all of you that have retrievers, you know well the mess they make. My lab loves to roll in dead animals, mud, manure, go jump in a lake, then run out, shake, and do it all over again. So when I saw that these collars were waterproof, solidly built, easy to clean, well designed and boasted a 'no-stink' claim, I became a customer for life.